Greenville boys tennis vs Wapakoneta Redskins. Greenville sophomore Jiahoa Zhang goes to the net in boys singles match against Wapakoneta in Monday night match. 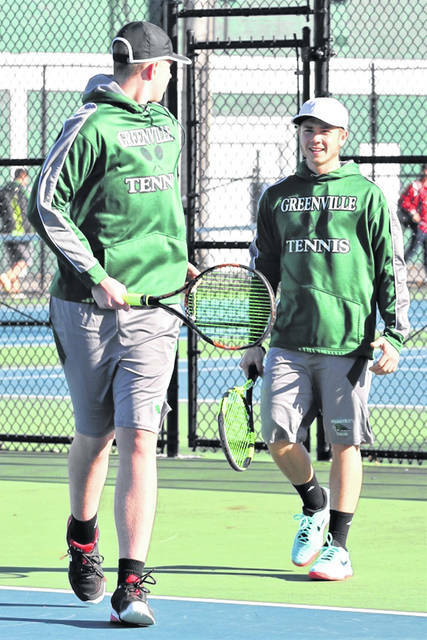 GREENVILLE – The Greenville varsity boys tennis team opened the 2019 season with a 3-2 non-conference win over the visiting Wapakoneta Redskins on a cold and windy night on the Greenville courts. Greenville’s Branson Leigeber defeated the Redskins Curtis Hughes 6-1, 6-3 in second singles. In first doubles Greenville’s Josh Galloway and Landon Muhlenkamp defeated Austin Hancock and Noah Kirby 6-1, 6-2 to open the season 1-0. Pablo Badell and Eric Price beat the Redskins’ Alvaro Guerrero and Jesse Mackenzie 6-0, 6-0 giving the Green Wave boys a sweep of varsity doubles matches on the night. Greenville freshman Jack Marchal lost 6-2, 6-1 to Wapakoneta’s first singles Jeffrey Adkins, three years at first singles for the Redskins. Wave sophomore Jiahao Zhang lost a tiebreaker 11-9 to John Doll after matches of 6-7, 6-1. Junior varsity matches on the night had Greenville’s Heath Coomer and Andrew Abell winning at doubles and Victor Livesay and Milan Denlinger winning singles matches. “I can still tell Fred (Matix) we’re undefeated,” Coach Kiser said with a chuckle. 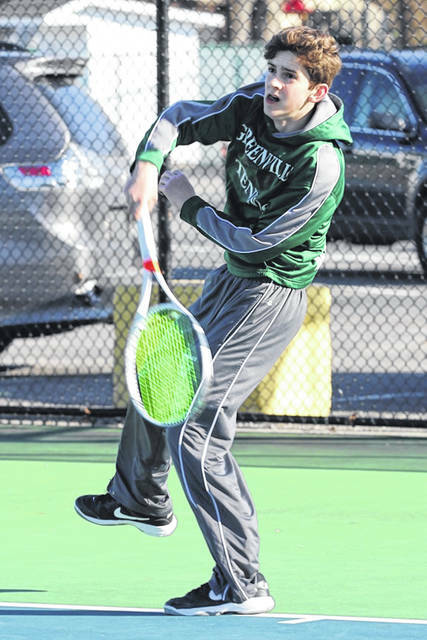 https://www.dailyadvocate.com/wp-content/uploads/sites/34/2019/03/web1_2.jpgGreenville boys tennis vs Wapakoneta Redskins. 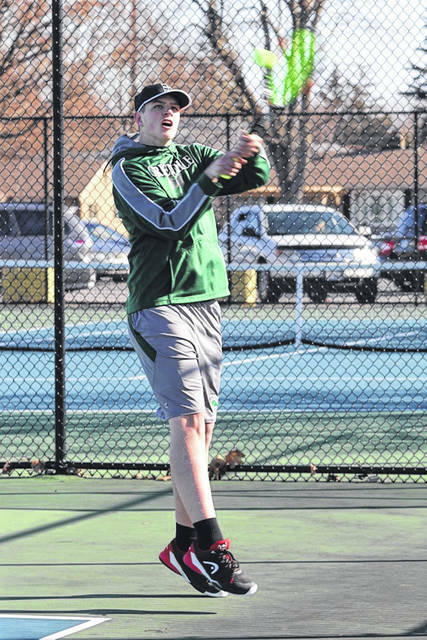 https://www.dailyadvocate.com/wp-content/uploads/sites/34/2019/03/web1_3.jpgGreenville boys tennis vs Wapakoneta Redskins. 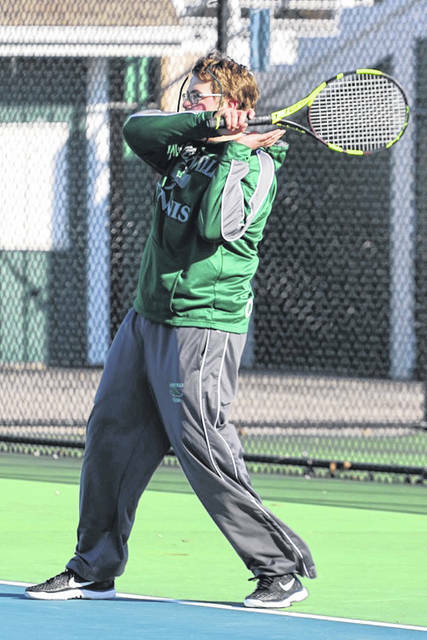 https://www.dailyadvocate.com/wp-content/uploads/sites/34/2019/03/web1_4.jpgGreenville boys tennis vs Wapakoneta Redskins. 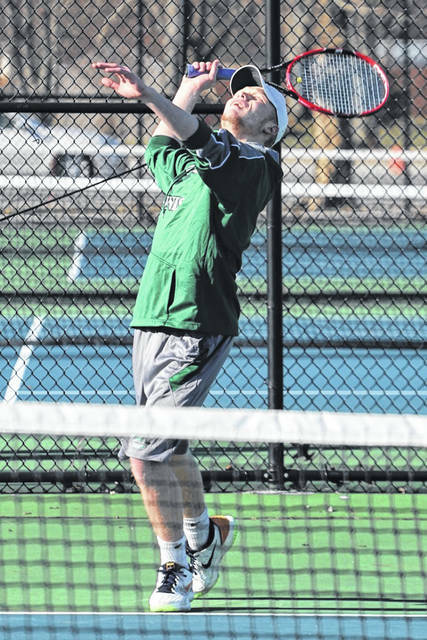 https://www.dailyadvocate.com/wp-content/uploads/sites/34/2019/03/web1_6.jpgGreenville boys tennis vs Wapakoneta Redskins. 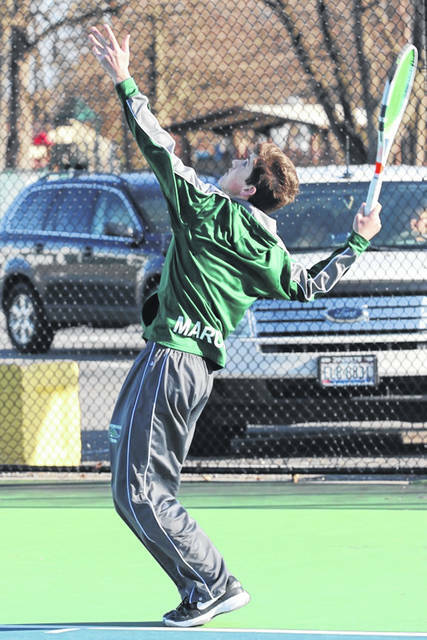 https://www.dailyadvocate.com/wp-content/uploads/sites/34/2019/03/web1_7.jpgGreenville boys tennis vs Wapakoneta Redskins. 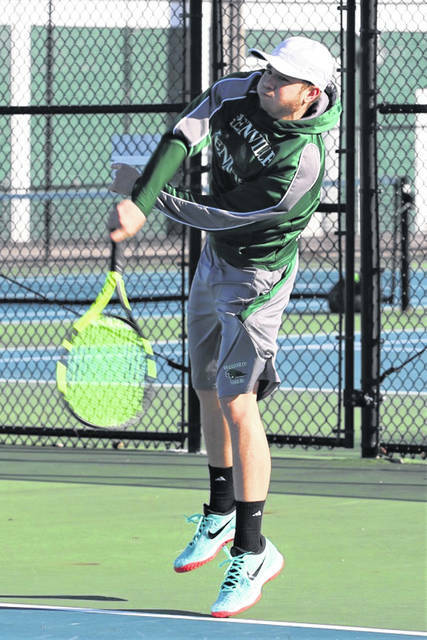 https://www.dailyadvocate.com/wp-content/uploads/sites/34/2019/03/web1_5.jpgGreenville boys tennis vs Wapakoneta Redskins. 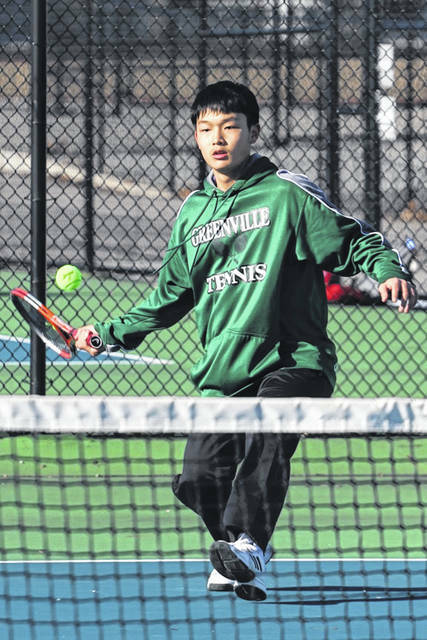 https://www.dailyadvocate.com/wp-content/uploads/sites/34/2019/03/web1_1-Jiahao-Zhang.jpgGreenville sophomore Jiahoa Zhang goes to the net in boys singles match against Wapakoneta in Monday night match.